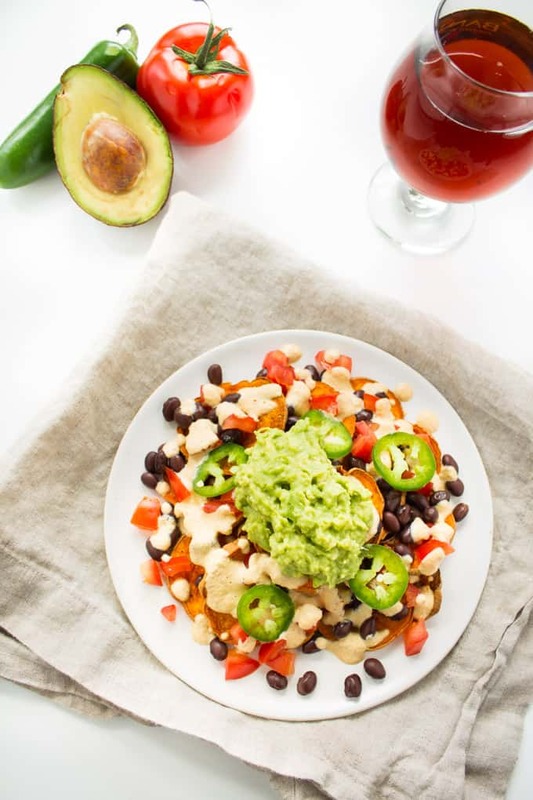 These vegan loaded sweet potato nachos are crispy, crunchy and topped with all the delicious fixings, including a cashew nacho cheese! Perfect for a game-day snack. I like football just as much as I like cucumbers. Not. At. All. But around this time every year, I succumb to watch two teams who are not the Buffalo Bills play against each other, wondering why I can’t time travel back to the early 90s so I can experience my hometown team going to the Super Bowl four consecutive years in a row. Of course, I would like to travel back as my adult self and not my three to six year old self who had no clue what the Super Bowl even was, only that she got to shake red, blue, and white pom poms around with her cousins and that seemed fun. To numb the disappointment, I bury myself in Super Bowl snacks and clever commercials. And if snacks are going to be the focus of the event, then I better make sure they are a winner. 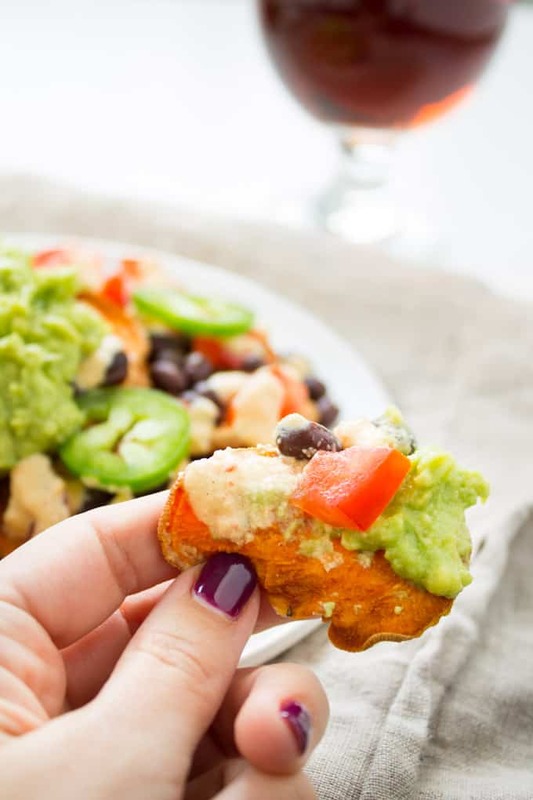 Nachos are hands down my favorite game-watching snack, but traditionally slathered in meat and cheese, it can be difficult to get my hands on some finger-licking-good chips. What if I told you I made a version of nachos that’s not only sans meat AND sans dairy but it’s gluten-free and corn-free too. That’s because they’re made with…SWEET POTATOOOOOESSSSS (said in my best Oprah voice). Yes, sweet potato chips. You heard right. Years ago I made nachos with Food Should Taste Good sweet potato tortilla chips and they were delicious so I thought why not make them with REAL sweet potaters?! This version is topped with tomatoes, black beans, cashew cheese sauce, jalapeños, and guacamole. Because every plate of nachos should be LOADED. There’s no other way to eat them, sorry. They turned out delicious. So delicious that I devoured an entire plate for lunch. They will definitely be a hit for any Super Bowl Sunday partay. 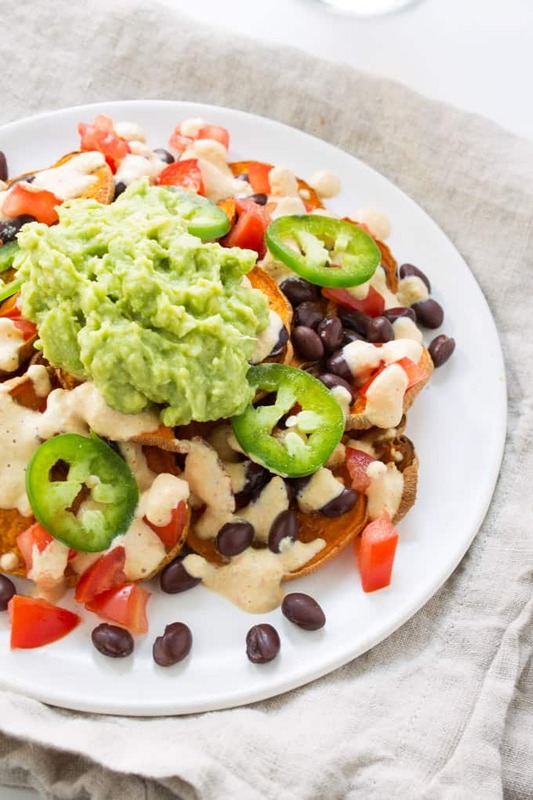 The sweetness of the sweet potatoes contrasts the spiciness of the jalapeños and the crunchiness of the chips is perfect against the creamy guacamole and cashew cheese sauce. 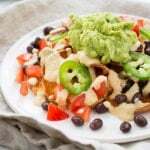 Who would’ve thought that you could have a plate of nachos that you can feel good about?! 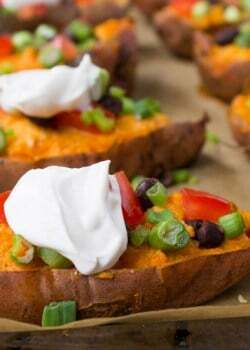 Sweet potatoes are loaded with vitamin C, vitamin A and potassium. 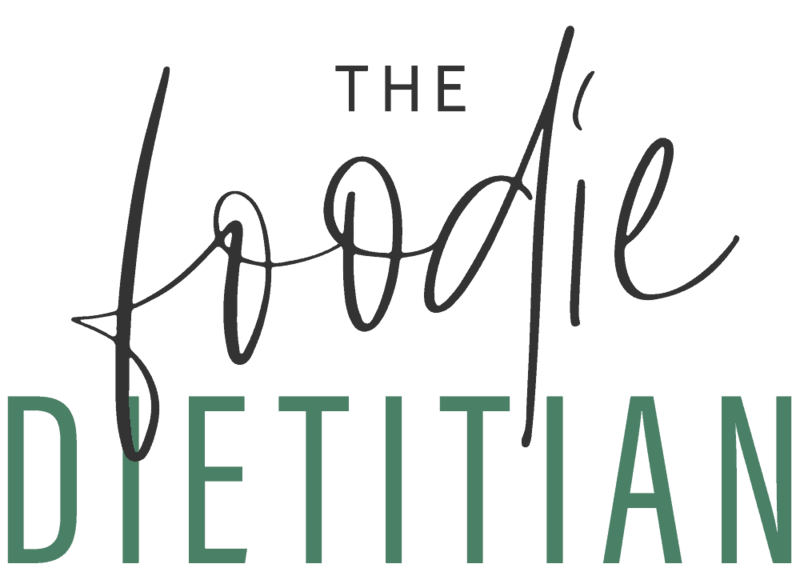 A root vegetable, sweet potatoes are also grounding and perfect to eat this time of year. With these nachos, I’ll take football and cucumbers any day. Okay, maybe just football. Toss sweet potato rounds in a medium mixing bowl with olive oil and salt and pepper to taste. In a small mixing bowl, mash avocado lime juice and salt together to make guacamole. 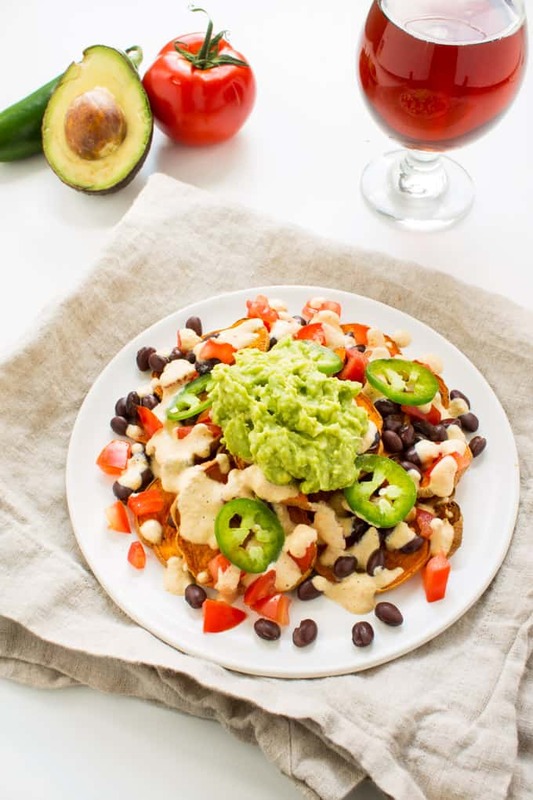 Layer sweet potato chips, black beans, tomatoes, cashew cheese sauce, jalapeno slices and guacamole. 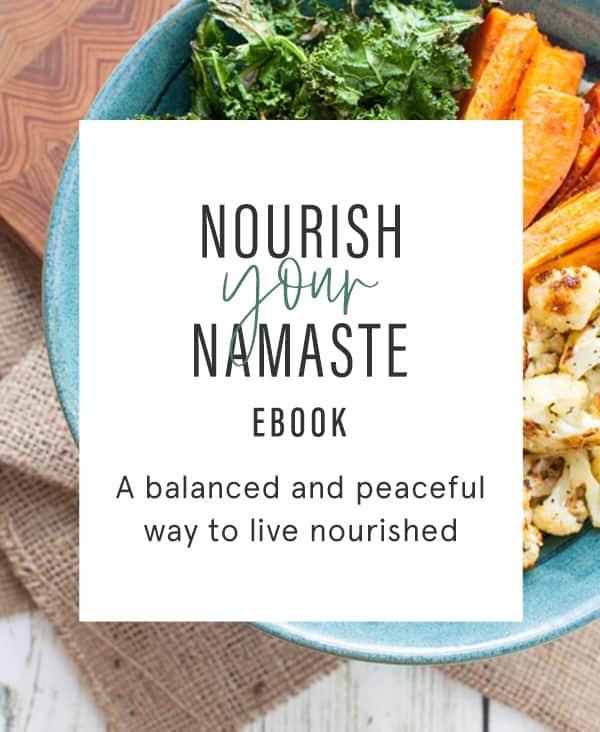 In a food processor, puree cashews, red pepper, nutritional yeast, spices, salt, and almond milk for 2-4 minutes or until hot, smooth and creamy. Pour over nachos. 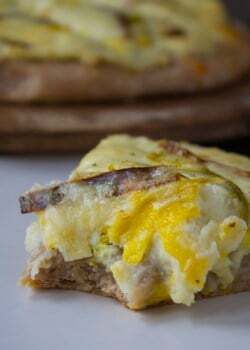 *Use a mandolin slicer to get thin slices or just finely slice with a sharp knife. **Baking times will vary based on thickness of chips. Tell me, have you ever made good-for-you nachos before? Nachos = my husbands favorite meal ever. With a dairy allergy, we never really enjoy them together. This will be on our table very soon!! Yay! Hope you and your hubs enjoy, Kelly! YES! I could sit and eat these nachos throughout the entire game! Sweet potatoes and guacamole are a match made in heaven! I have never made go for you nachos before. We love nachos in our house. Not sure if I can get my hubby to convert to a healthier version, but I love this! So. much. GOODNESS!!!!!!! these are making me drool! Scheduled a pin for later! :)! Thanks for sharing, Rachel! Yum! These nachos look so good! So creative! 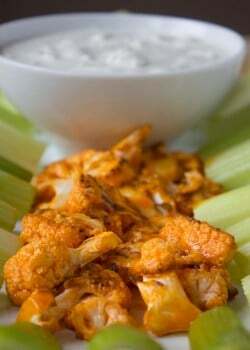 These look so tasty and I love how you incorporate nutritional yeast. I have just enough leftover from my cheesy popcorn. Pinning to make! Woohoo! 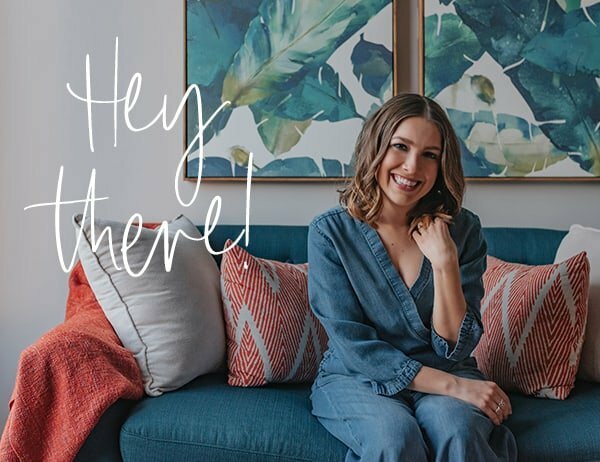 Thanks for sharing, Lauren!